La Celebración De Fiesta Let’s Talk About it... Who Should be Our Next President? This grass roots publication is the life source for a community that is not easily afforded viable access to diverse and accessible media. San Antonio and the surrounding counties have become accustomed to relevant news brought to them in both English and Spanish since 1913. Let’s Talk About it... Who Should be Our Next President? The mission of the Westside Development Corporation (WDC) is to foster economic development, promote the development and redevelopment of real estate within its target area, create viable urban communities, and preserve the character, culture and history of the Westside. The vision is a vibrant Westside community where people want to live, work, and visit. 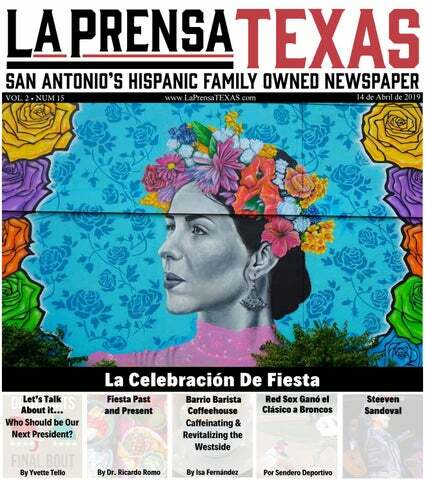 Leonard Rodriguez President /CEO leonard@westsidedevcorp.com La Prensa Texas San Antonio is published once a week by La Familia Duran Inc. San Antonio, Texas (210) 686-0600. Subscription price in the U.S.A. $125 per year (52 issues). The opinions expressed in the editorials of this publication represent the positions and ideology of this newspaper; the opinions expressed by writers and guest columnists are not necessarily the opinions of the management staff or ownership of this newspaper; the contents of which they are solely and exclusively responsible for. Letters from our readers are welcome and will be published, subject to space availability so long as they are signed and have a proper return address. All letters will be reviewed and edited for offensive language, libel, slander, defamation, proper grammar, spelling, and accuracy, according to our style. 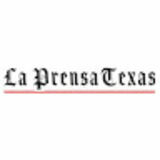 La Prensa Texas San Antonio is not responsible for advertisements that may be deceitful or fraudulent, and does not guarantee in any way the products or services offered, of which only the advertiser is responsible. All Rights Reserved. Published and printed in the United States of America. several other corporations. In a recent effort to expand their branding campaign, for example, the Spurs merchandising team contracted Shek to design caps and T-shirts incorporating images that reflect graffiti and mural art. Shek has formed several small businesses related to muralism and fine art printing. His studio at 1906 South Flores is in the heart of Southtown, The Arts District. The studio is filled with newly painted art canvases as well as Spurs-Los Otros merchandise. Shek noted that the Spurs’ merchandise is available online or at the ATT Center. For Shek, there is never enough time in the day to complete all his projects. they want in there,” adding, “If you notice, it’s turning more toward gringos being there.” I hope Fiesta will be with us for many decades to come, and I hope young Mexican Americans will continue to graduate from our inner-city schools. Young students of every ethnicity and race look to role models to emulate. Fiesta can be a vehicle for fun and food, but it should and can be much more by providing a diversity of role models that represent the best of San Antonio. By Leonard Rodriguez This column highlights inspiring stories of Latino leaders. For more than 500 years, Latino men and women have positively influenced the face of United States society. Let us celebrate these outstanding hispanics. Isa Fernández, MPA is a Legacy Corridor Business Alliance Program Manager at Westside Development Corporation, a freelance photographer and peace and justice advocate. lecciones de su más reciente álbum, 100 Litros de Tequila, también rendirá homenaje a la tradición de la charrería mexicana con canciones como “Mi Fiesta Charra” y “El Toro Coquito”. Después de catorce años de figurar como la primera voz del legendario Mariachi Vargas de Tecalitlán —y ahora como artista solista por derecho propio— Sandoval regresa orgullosamente a San Antonio, una ciudad en la que la música de mariachi es altamente respetada, en donde se enseña desde la escuela secundaria hasta la universidad, y en donde por los últimos veinticinco años Cynthia Muñoz, presidenta de Muñoz Public Relations (MPR), ha producido el internacionalmente renombrado evento Mariachi Vargas Extravaganza. Steeven Sandoval, cuyo apodo es “La Voz del Mariachi”, se le conoce como charro cantor, título honorífico que se da al que representa al auténtico espíritu del folclor mexicano y que sabe interpretar la música de mariachi en su forma más tradicional a través de su voz y su presencia. Sandoval deleita a su auditorio con gracia, elegancia, humildad y gratitud. Se le conoce por la sincera emoción con la que interpreta cada canción, que con frecuencia conmueve a su público hasta las lágrimas. 9 Mariachi Vargas y con el Mariachi Nuevo Tecalitlán. Estrenó 100 Litros de Tequila, su primer disco compacto como solista, en 2017. El disco contiene temas de mariachi como “Te Hubieras Ido Antes,” “A Los Cuatro Vientos,” y su canción emblemática, “Por Amor”, todo lo que ha atraído millones de vistas en YouTube. Sandoval ha actuado a lo largo de Estados Unidos, Europa y América Latina. Con la compañía Houston Grand Opera, ha participado en dos óperas de mariachi: Cruzar la Cara de la Luna y El Pasado Nunca se Termina, inclusive en el Théâtre du Châtelet de Paris, Francia. permits, providing needed infrastructure and promoting the business corridors to the entire community. I am pleased that WDC has taken up the challenge and look forward to the project’s long-term success,” she said. The Westside Business Alliance initiative will result in policy recommendations to Council District Five and serve as a hopeful pilot for similar endeavors for other San Antonio business corridors. For more information about the Westside Business Alliance, please visit https://westsidedevcorp. com/legacy-corridorbusiness-alliance/ or call 210-501-0192. COMPROMETIDOS CON UNA PRODUCCIÓN DE ENERGÍA ACCESIBLE, CONFIABLE Y AMBIENTALMENTE SOSTENIBLE Texas se encuentra a la vanguardia del renacimiento energético de Estados Unidos. La producción de energía de Estados Unidos está llegando a niveles históricos y con eso también nuestro compromiso con el medio ambiente y con las comunidades donde operamos y empleamos a nuestros vecinos, familiares y amigos. Es por eso que creemos en la importancia de contar con infraestructura avanzada en tubería, que nos ayude a transportar su energía de manera segura desde el punto A al punto B. Al mismo tiempo reduciendo las emisiones para un aire más limpio y ayudando a mejorar el tráfico, al quitar pipas de transporte de combustible de la carretera. Invertimos en tu seguridad, trabajo y un entorno más saludable en las áreas donde trabajamos, vivimos y jugamos. Estamos aquí en cada paso del camino hacia un futuro mejor para todos los tejanos. © Copyright 2019. Pagado por el Instituto Norteamericano de Petróleo. Todos los derechos reservados. as a child; Family – violent or dysfunctional family bonds; or Community – high poverty or crime rates. Child abuse can have physical, psychological and behavioral effects on a child. Some may have trouble forming intimate relationships as an adult. When a child has prolonged exposure to stressful situations, it can impact a child’s brain, body, hormones and immune system. Children will also have an increased risk of developing a mental disorder including depression, anxiety, eating disorders, or attempt suicide. A child’s behavior could also be affected. He or she may become a smoker, abuse alcohol or drugs, become a teen parent, experience juvenile arrest or low academic achievement. Child abuse prevention requires individual, family and community level supporters. Together we can make a difference. Community resources are available to families which include counseling, positive parenting workshops, and prevention programs at school, hospitals, churches, etc. Parents need to make it a priority to work on their mental health and educate themselves more on child development. Once parents gain insight and learn how to effectively deal with their own issues, they will better understand their child’s behavior and react in a healthy and positive manner. Are you or someone you know a victim of child abuse? TCP Marriage & Family Services is here to help. For more information on our services, please call our office at (210) 516-2607 or visit our website at: www. tcpmfs.org. Fresenius Kidney Care treats the whole you offering quality dialysis care including home dialysis options as well as education, support and inspiration to help you live a full life. © 2019, Fresenius Medical Care, All Rights Reserved. *Ver Programa de Tarifas para cargos aplicables. Should You Borrow from Your 401(k)? Edward Jones is a licensed insurance producer in all states and Washington, D.C., through Edward D. Jones & Co., L.P. and in California, New Mexico and Massachusetts through Edward Jones Insurance Agency of California, L.L.C. ; Edward Jones Insurance Agency of New Mexico, L.L.C. ; and Edward Jones Insurance Agency of Massachusetts, L.L.C. of doing this is to build an emergency fund containing six months’ to a year’s worth of living expenses, with the money kept in a liquid, low-risk account. You also might find some resources in the part of your investment portfolio held outside your 401(k). For example, you can always withdraw contributions to a Roth IRA without incurring taxes (although the earnings on these contributions could be taxable if you take the money out before you’re 59½ and you’ve had your account less than five years). In any case, you work hard to build your 401(k) – so, no matter where you are in life, think carefully about how you will use the money. Battle of Flowers Parade San Antonio’s Fiesta Battle of Flowers Parade had its origins in 1891 when a group of women planned Battle of Flowers Parade an event to honor the heroes of the Alamo and the heroes of the Battle of San Jacinto. They decorated San Antonio’s Fiesta of Flowers Parade hadand its celebrated origins in 1891 when a group women planned carriages, wagons, andBattle bicycles with real flowers by throwing flowerofblossoms into the an event the heroes ofof the Alamo and heroes of the Battle of San Jacinto. They crowd, andtosohonor the name “Battle Flowers”. Thethe Battle of Flowers Parade, which started as adecorated small carriages, wagons,into and Fiesta bicycles with areal flowers and celebrated by throwing flower blossoms into the event, has evolved Week, ten-day city-wide celebration. This parade draws several crowd, and so the people name “Battle of Flowers”. The is Battle of Flowers started a smallby hundred thousand each year. The parade so popular thatParade, it’s alsowhich televised andas viewed event, million has evolved intoThis Fiesta Week, ascene ten-day city-wide This parade draws several several viewers. postcard is circa early celebration. 1900’s. hundred thousand people each year. The parade is so popular that it’s also televised and viewed by several million viewers. This postcard scene is circa early 1900’s. The key element in every personal loan? The person. Unmatched service. Multiple loan options. And a trusted partner to help you find the right one. Talk to a Frost banker at (800) 51-FROST or visit your nearest financial center. truth and being transparent. Check the Texas Department of Licensing and Regulation to make sure if the type of work your contractor will be doing requires a license. Ask for references from friends and relatives and get everything in writing. • Resist high-pressure sales. Some storm chasers use tactics such as the “good deal” you’ll get only if you hire the contractor on the spot. Be proactive in selecting a contractor and not reactive to sales calls. Be especially careful of door-to-door contractors. Many municipalities require a solicitation permit if sales people go door-to-door. Ask for identification. It’s always best to get three estimates from different contractors. • Don’t sign over insurance checks to contractors. Get an invoice from the contractor and pay them directly (preferably with a credit card, which offers additional fraud protection over other forms of payment). Don’t sign any documents that give the contractor any rights to your insurance claims. If you have questions, contact your insurance company or agent. • Be wary regarding damages you can’t see. While most contractors abide by the law, be careful allowing someone you do not know to inspect your roof and other areas of your house. An unethical contractor may create damage to get work. The same goes for attics, crawl spaces, ducts and other places you cannot easily access or see for yourself. To learn more, visit bbb. org/storm. Just a Thought Fiesta is almost here! Antonio would be complete without seeing the Battle of the Flowers Parade. This parade has the special distinction of being the only parade in the U.S. that’s planning and direction is completed by women. It’s the Fiesta’s biggest parade, and it’s only rival in size in the nation is from the Tournament of Roses.9:30 a.m-2:30 p.m. April 26th. Another exciting parade is the Fiesta Flambeau Parade. You might think if you’ve seen one parade you’ve seen them all, but “No” you haven’t. You will be missing out. The Fiesta Flambeau is the biggest illuminated night parade in the United States. You will experience marching bands in lockstep, dancers, precise drill teams and much more. Everything takes place under a spectacular array of lights. 27th April, 7 p.m. -10:30 p.m. Lastly, don’t forget to spend some quality time with your relatives at the festivals within the Fiesta. A Night in San Antonio is a four-night event put on by the San Antonio Conservation Society. It features 15 different themed areas, such as the French Quarter and Clown Alley. The proceeds for this part of the Fiesta help with historic preservation throughout the city. Fiesta 2019 is ready to accommodate thousands of participants have a San Antonio Fiesta to remember. Drive safe, be aware of your surroundings and have lots of fun while doing it!